Happy Friday! I am grateful Jacky Davis and Giselle Potter dropped by to chat with me about Olive & Pekoe: In Four Short Walks, chipmunks, color pencils, and picture books. I wrote the words in purple, Jacky wrote the words in black, and Giselle wrote the words in green. Thank you, Jacky and Giselle! 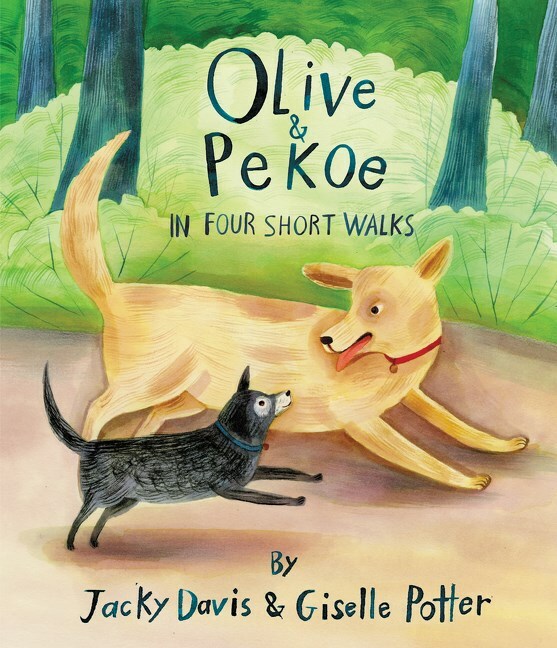 Olive & Pekoe: In Four Short Walks tells the story of walks with friends, and the importance of friendship no matter the differences between us. Making time to walk and talk together creates a happy, healthy life, no matter if you’re young or old, small or big, slow or fast. Giselle Potter’s illustrations are amazing, and capture our dogs’ bemused expressions that speak to the playful and familiar aspects of everyday life. Chipmunks are bonkers, the way they dart around the forest floor is pure excitement. It is clear they know a thing or two about how to get around their environment. Picture books are journeys into worlds that create an immediate and full storytelling experience. In some ways, they are like walks in the woods- you enter into them not knowing what you’ll discover, yet you continue on as the world presents itself. Then it’s time for a snack! 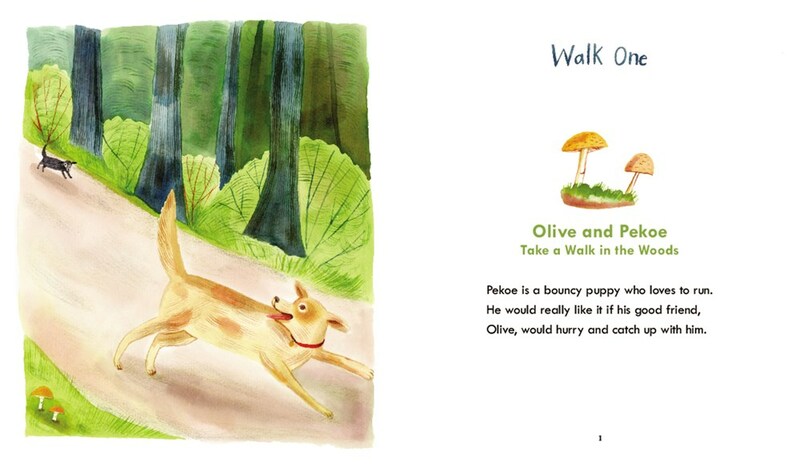 The book trailer for Olive & Pekoe: In Four Short Walks was very hard for me to make! I STRUGGLED to teach myself how to do animation for it! The pictures seemed like they were meant to move and it seemed like an easy enough task to animate them but oh no! Even though the result is a very short trailer of Olive and Pekoe moving very awkwardly, I felt a sense of accomplishment to have done it at all. The sound is my husband playing ukulele and whistles. Did you know Olive and Pekoe are really our dogs? Olive was my old, small dog and Pekoe is Jacky’s big, young pup and this book is about their truly unlikely friendship. Since Olive was elderly and a bit cranky, she sometimes snapped at energetic, bouncy dogs but she loved Pekoe. She would squeal with excitement every time she saw him and would struggle to catch up with his bounding leaps. In his aloof way, I think Pekoe also loved Olive. Watercolor, ink, and color pencils are the materials that are usually listed for my pictures. Lately I mostly use little bottles of Dr. Ph. Martin’s radiant concentrate watercolor. I like the vibrant colors better than other watercolors but they are also hard to use because they are like permanent dyes that can’t be changed. So I end up redoing pictures a lot. Picture books are stories told with pictures. The words decide the pictures and the pictures illuminate the words. Sometimes when I illustrate a writer’s story, I have to make up everything but this was an unusual book because the writer is my friend, Jacky, and the story is about our real dogs. Giselle Potter is the illustrator for more than thirty children’s books, including The Year I Didn’t Go to School, inspired by her experience traveling through Italy with her parents’ puppet troupe. Her illustrations have been published in the New York Times, the New Yorker, the Wall Street Journal, and the Boston Globe. She lives in New York’s Hudson Valley with her husband, two daughters, and their dog, Olive. Borrow Olive & Pekoe: In Four Short Walks from your school or public library. Whenever possible, please support independent bookshops. Reading Gives You Superpowers Week!